In examining the relationship and conflict between the medical and social perceptions of deafness, I began to evaluate how certain medical practitioners strove to implement their medical expertise and authority upon educational institutions for the deaf. John Harrison Curtis was no exception to the growing body of aurists who attempted to increase their reputation with positions in established institutions during the nineteenth century. Roughly between 1817 and 1830, Curtis argued that an aurist needed to be a necessary—and permanent—fixture in institutions for the deaf, in particular, the London Asylum for the Deaf and Dumb. The Asylum for the Support and Education of the Deaf and Dumb Children of the Poor was established in 1792 by Reverend John Townsend (1757-1826) of the Jamaica Row Congregation Church in Bermondsey, London. Townsend became acquainted with the plight of the deaf child when one of his parishioners, a Mrs. Creasey, sent her son to the Thomas Braidwood’s (1715-1806) academy for the deaf in Edinburgh. The boy’s ability and accuracy in mastering speech impressed Townsend, who then agreed with Mrs. Creasey on the necessity for a charitable institution that would counteract the privatization and expense characteristic of the Braidwood institutions. With the support of Henry Cox Mason (c.1755-1804), rector of Bermondsey and the philanthropist and banker Henry Thornton (1760-1815), Townsend established the Asylum. Admission to the school was through a public selection process voted by the Committee of Governors of the Asylum, usually reserved for candidate between six to twelve years of age of “sound mind,” on the basis of their biographical sketch. Where six children were originally admitted in its founding year, at each yearly half-election, the governors of the Asylum accepted a few more; yet the number of children waiting to be admitted increased yearly, and by 1804, Townsend sought new dwellings for the growing institution. 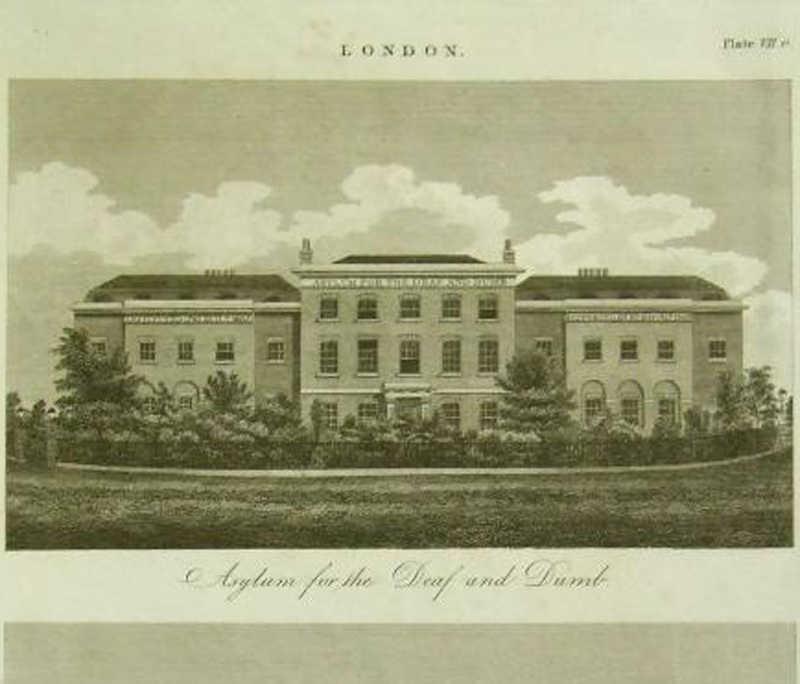 With the patronage from the Duke of Gloucester, the Asylum moved to Old Kent Road in London in 1807, and construction for the new institution completed in 1810. Braidwood’s dynasty in deaf education persisted as his nephew, Joseph Watson, served as the superintendent of the Asylum. Watson also published Instructions for the Deaf and Dumb (1809), which outlined the Asylum’s methods of education. Informally renamed the London Asylum for the Deaf and Dumb, the institution eventually became an important national charity and its model of patronage and governing committee did much to transform the operating systems of charitable institutions in Britain. The results would thus elevate the children “from a dark and dreary state of ignorance,” and place them into an active participation and employment of society. The success of education at the Asylum led to a greater a recognition of the necessity for educating the deaf, resulting in a rapid expansion of institutions for the deaf in Britain. The various institutions that were established all over Britain grew out of the “secretive, private [and] individual initiatives…characterized by nepotism, philanthropy and compromise,”[§] of the Braidwood dynasty. Armed with a secular agenda nurturing a comprehension of Christianity, these institutions attempted to engage rational beings by teaching them their duties towards God and man, while at the same time preparing the young pupils for responsible adulthood. [*] William Gilbert, “Deaf and Dumb Asylum,” in Good Words for 1873, ed. Rev. Donald MacLeod (London: W. Ibister & Co., 1873), p.253. Also: Anne Borsay, “Deaf Children and Charitable Education in Britain, 1790-1944” in Medicine, Charity and Mutual Aid: The Consumption of Health and Welfare in Britain c.1550-1950. Eds. Anne Borsay and Peter Shapley (Aldershot: Ashgate Publishing, 2007), p.73. [†] Jan Branson and Don Miller, Damned for Their Difference: The Cultural Construction of Deaf People as Disabled (Washington, D.C.: Gallaudet University Press, 2002), p.15. [‡] Asylum for the Support and Education of Indigent Deaf and Dumb Children of the Poor, Plan of the Asylum for the Support and Education of the deaf and dumb children of the poor, including purposes of instruction; rules of the society; and list of the officers and governors (Shackwell: Printed by T. Rutt, 1807), p.5. [§] M.G. McLoughlin, A History of the Education of the Deaf in England (Liverpool: G.M. McLoughlin, 1987), p.2. [**] John Harrison Curtis, A Treatise on the Physiology and Diseases of the Ear, 6th Ed (London: Sherwood, Neely & Jones, 1836), p.161. I am trying to find out more about James Ruskin b 1818 in Cheshunt and who according to 1851 and 1861 census was deaf. between 1841 Census and 1851 he was living close to the Deaf and Dumb Asylum on Old Kent Road with his wife who was also recorded on the Census as deaf. I am interested in finding records od admisson that may confirm he and his wife might have been pupils at the Asylum and also more about life in the Asylum. Did you get anywhere with finding records on James Ruskin b 1818 who was perhaps institutionalised at the Deaf and Dumb Asylum in Old Kent Rd, Margate. My grandpa’s 2 sisters were deaf and I think they were there. One sister’s husband was there in 1911 as it shows him as a resident on the census from that year. My g aunt, Hannah was supposedly there as she is crossed out with some notation on the 1911 census for my g grandparents. Hope you get this email as it has been a long time since you posted this enquiry. As far as I know, all the records of Townsend’s Asylum are now held by The John Townsend Trust, which incorporates the Royal School for Deaf Children Margate (formerly the Old Kent Road Asylum) and the Westgate College for Deaf People. They have archives, some of which dates back to the early-1800s, and there are records of children admitted. I do know, however, that researchers are not allowed into the archives (health & safety constraints), but they can dig around for you if you place a specific request. and the email is there as well. Likewise, have you checked out Patrick Beaver’s “A Tower of Strength: Two Hundred Years of the Royal School for Deaf Children, Margate”? It’s a great overview of the history of the London Deaf and Dumb Asylum, and Beaver even outlines what life was like at the Asylum and provides some portraits of the pupils there. My grandfather’s sister was deaf and I think she was at the Old Kent Rd Asylum in 1911 as noted on the 1911 census for my grandfather’s family. Her name was Hannah Ouspetter / Osbeter ( could be multiple spellings as my great grandpa probably did not speak English). She was born around 1900. Am I able to access her record? Also, the British historians Peter Jackson and Raymond Lee have a book, “Deaf Lives: Deaf people in History” that might be some help, as might Jackson’s “Britain’s Deaf Heritage” (but it focuses more on the education system and asylums than individuals). I have a boy of thirteen years who is deaf by birth. He is studying here in a deaf & dunb school but educational system here is not satisfectary as per my requirments and the need of time. Pl. help me out to get admited my son who is very sharp and intluctual to get admited in the best school in UK. I’m sorry, but I’m not affiliated with the school in any way–I’m just a historian writing about the history of the school. I suggest you contact the school directly. I came across your posting on James Ruskin b. 1818 in Cheshunt. I am researching my family history and he is my 3rd great Grandfather on my mothers side. I would be happy to share what I have, my email address is ian.forshaw@gmail.com. I’m not sure if you’re still checking this blog…but I was wondering whether only boys were admitted? What were the options for deaf girls in the 19th century? Thanks! From what I’ve seen, both boys and girls were admitted to the asylum. Some records indicate that they were housed in separate wings. Check out ‘Bermondsey 1792’ by Raymond Lee–it gives an overview of the institution based on some of the archival records.